We've all been in the situation before- you're at a restaurant on a big date or with important client when the wine list is dropped in front of you with a thud. Understandably, your reaction might be to hightail it out or order a beer and skip the daunting process all together. Some wine lists are as thick as the Twilight series. 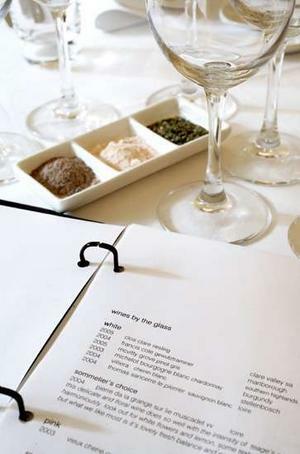 Wine lists are organized differently. And choices abound from every region, at every price. The combination of factors makes the process intimidating, especially if your dinner companion is a wine enthusiast, or worse yet, a connoisseur. Since it's impossible to know every wine producer in the world, you need to pick your wine through a reliable process. 1) First, let your dinner companions figure out what they're eating. The old waiter’s habit of asking asked what you'd like to drink before you've had a chance to review the menu should stop! 2) Use your resources, i.e. the waitstaff or the sommelier. Sommeliers love giving suggestions and may even produce the “perfect bottle” that isn't on the list. Give the sommelier some direction to ensure you get something you’ll like. Know whether you want white or red. You also probably know whether you want a red that's big and bold or light and fruity or a white that's crisp and fresh or smooth and buttery. Alternatively, describe a great wine you had recently. 3) Know your budget and make it clear to the waiter, surreptitiously.